A letter of denial. 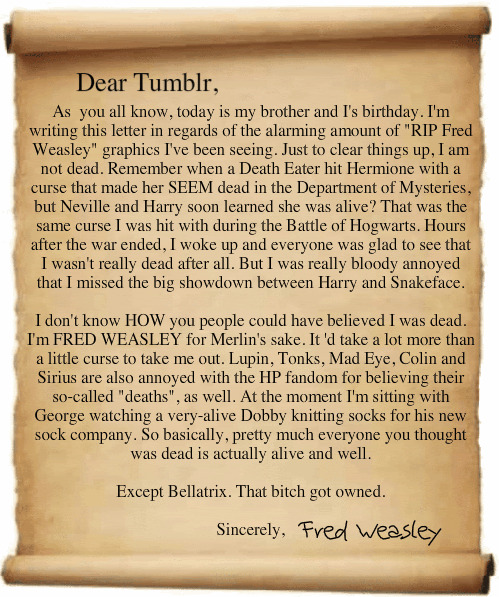 Fred Weasley denies it all.. Wallpaper and background images in the Fred Weasley club tagged: fred weasley letter. Fred Weasley denies it all. In that last one i ment to do this. IT'S STILL HAPPY!!! DON'T JUDGE! love it!!!!!!!!!!! just like fred 2 send that. This is exactly what I have been trying to tell everyone for the past ELEVEN YEARS! Made my day.. HES ALIVE!! Hahaha ababa ah. BWAHAHAHAAHHAHAHAHHAJAHAA. There's my Fred. You go,!! I knew it! Nothing that sad can be true! I'm happy you're alive Fred, but it wasn't a curse that hit you it was an explosion in the Room of the Requirements. YAY SIRIUS AND LUPIN ARE STILL ALIVE WOHOOOO!